The purpose of this article is for the Handy Father to teach his children how to pick up a bluegill. 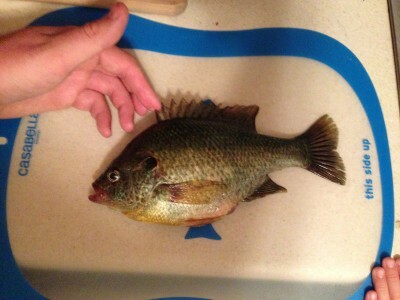 Teach your child how to pick up a bluegill. This will eliminate painful punctures from the dorsal spines. Fishing is one of the activities that fathers often teach their kids. Bluegill are a popular panfish that are easy to catch, and easy to fillet. It is the perfect type of fish for kids to catch. The only problem I’ve encountered when fishing for bluegill is that when caught, caution must be taken because a caught bluegill will point its dorsal fins straight up. A bluegill has spines in its dorsal fin that are needle sharp. If punctured by these spines, it is essential to wash out the wound as soon as possible to avoid infection. The simplest method how to pick up a bluegill is by sliding the hand down the body of the bluegill from the head back. Put fingers at the top towards the spine, sliding them across the top of the bluegill. This will lay the dorsal fins down flat on the fish. The spines in the dorsal fin will not be an issue at this point. The fish, firmly in hand is now ready to be placed in a Wire Fish Basket or live well. When it comes to teaching this method of how to pick up a bluegill to a child, it is best to start with a smaller fish than a keeper-sized bluegill. It stands to reason that a small fish will be easier to hold for a child because a child’s hands are small. The same basic method is used as stated above, except that while a fish is still on the line, hook in mouth, you as the Handy Father should hold the fish steady. Hold the fishing line directly outside the mouth of the fish or at the hook if it’s visible. A steady fish is easier for a child to handle, and gives them the best opportunity to learn proper handling technique. Repeatedly helping a child with fish handling when they first are learning is a good way to rid them of possible fear of being punctured. Once they get the hang of handling fish, graduate them into removing the hook from the fish by themselves.